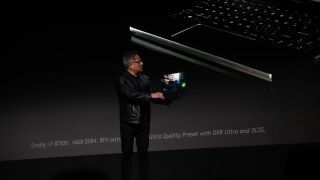 During its exhaustive CES 2019 press conference, Nvidia finally pulled the curtain back on RTX graphics for laptops. Nvidia already has several options in terms of performance available, and every gaming laptop maker is on board. A whopping 40 gaming laptop models are launching with the new graphics inside starting January 29. "RTX notebooks are available from every OEM in the world," Nvidia CEO Jensen Huang said on stage. This new line of graphics processors for laptops includes Nvidia's storied Max-Q design for thin-and-light frames as well as chips that aren't far from their desktop counterparts in terms of power. Of those 40 total new RTX laptops, 17 – nearly half – are Max-Q designs. Which RTX graphics can you get in a laptop? Nvidia is issuing several versions of RTX graphics for laptops. For the entry-level, RTX 2060 laptops are available, as well as 2070 and 2080 iterations for the mid-level and high-end, respectively. And, 'high-end' is the right word to describe it: the RTX 2080 for laptops outperforms the desktop-grade GTX 1080, according to Nvidia. For fans of Ultrabook-like gaming laptops, Nvidia will have thinner and slightly lower-power Max-Q designs for the RTX 2070 and 2080, too. This announcement brings the power of ray tracing and machine learning in computer graphics rendering to laptops. Of course, what that ultimately means is even more realistic and visually engrossing games. Huang ended his keynote in simply saying, "The next-gen is on" – tough to argue with that.